I picked a huge bowl full of Blackberries at the beginning of August and then I was daydreaming what I could make with them. It could be muffins, tart, cake and bread… I mainly used them for baking but there was one recipe for dessert that I wanted to try. It was a plain Frozen Yogurt. So I combined the recipe with my beautiful Blackberries in my mind and started making the dessert. I used a tub of Greek Yogurt flavoured and sweetened with honey. The original recipe I referenced had lots of sugar mixed in so I add just 2-3 Table spoon full of sugar on top. It was quite good and not too sweet and had some sourness from the Blackberries and yogurt too. If you prefer the sweetness for the chilled dessert which sold in a shop you can add some more sugar on this recipe. So I made this Matcha Soy Latte in exactly same way as my quite recent post: Iced Matcha Tea but just change Water into Soy Milk. There are several grades in ‘Matcha‘ Green Tea sold in a shop. I normally use average grade of Matcha Tea for baking Cakes. That is because the delicate flavour of best Matcha Tea gets kind of lost during baking. However, for this Matcha Soy Latte because it is for drinking, tasting and admiring the intense Matcha flavour, I used higher grade Matcha Green Tea Powder. When it becomes hot and humid in summer, there is only thing comes to Japanese people’s mind. ‘Kakigori’ is Shaved Ice with some sweet syrup. We love it during a very hot and humid Japanese summer. Japan is composed of a collection of many islands that lies very long from the North to the South so that there is slight difference in weather but anywhere in Japan we cannot escape from the heat and humidity in summer time. So, what do we do? We enjoy eating the food that beats it! That is the way how Japanese people’s mind work. ‘Kakigori‘ shaved Ice is the best remedy. 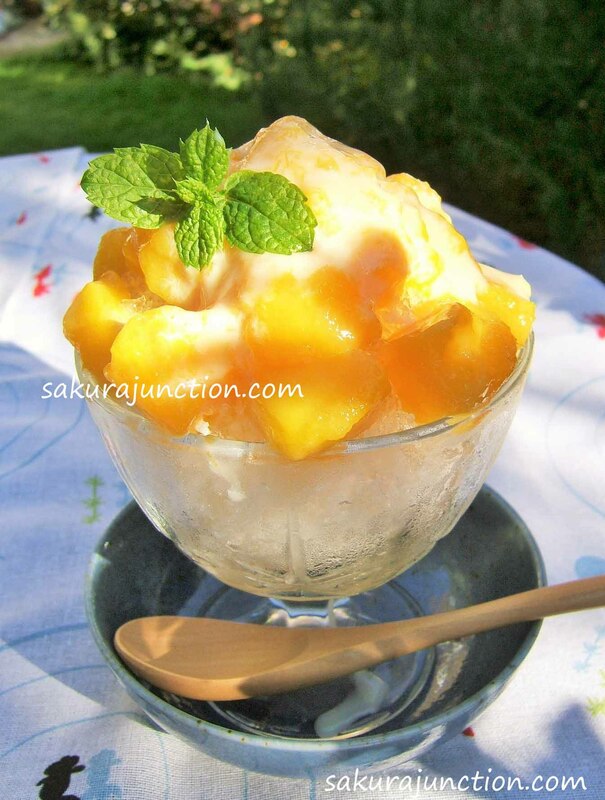 Actually I have introduced ‘Kakigori with Mango‘ last year (Remember this ↑ flag?). 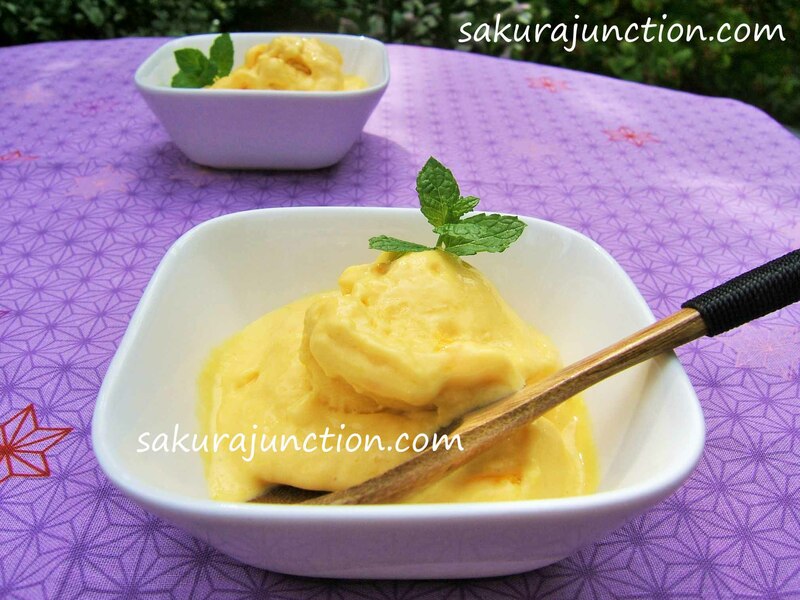 Mango flavour is fairly modern in Japan, so this time I made the most traditional flavour for Kakigori. That is ‘Uji Kintoki‘ flavour. I like ‘Matcha‘ Green Tea. Actually since I was a child I really liked the taste. Although we had a set of Matcha making tools at home my mother did not make Matcha tea that often. Only when we had very good Japanese sweet ‘Wagashi‘ my mother brought out the set and made Matcha tea for us. Maybe that is why I thought having Matcha tea is something special. It was more like for ceremonial occasions and I still get excited about the whole process. I think Matcha’s popularity these days is phenomenal. Western people knowing its Japanese name ‘Matcha’ was unthinkable to me until 5 years ago and it is unbelievable that there are several shops and cafés serving Matcha drink or food even here in London. Now we have been informed that there are great health benefits in Matcha and it is not just foodies but healthy food eaters are joining the Matcha drinking club. I have been on a quest for searching a great way of using ‘Houjicha‘ Japanese Green Tea. When I saw a photo of Parfait dessert on a magazine I thought “This is it! It must be definitely tasty if I make this with Houjicha flavour”. I also wanted to add some colour and texture to it. As I posted earlier I have been harvesting Raspberries in my garden so I decided to use some into this dessert. With soft, melting but slightly crunchy texture, roasted Green Tea aroma and fresh sweet and sour soft fruit … I think it is perfect to combine Houjicha and Raspberries all together to make a Parfait. It is a great dessert for a dinner with friends. The best thing about this dish is that it is so simple to make. No fiddliness and no failure. I added some Raspberry and ready-made Meringue but you can use any other soft fruit or you don’t need to add anything at all. It is delicious as it is. ‘Drinking Kale? That must be awful!’ That was what I was thinking until two days ago. I have a food processor but did not own a juicer/smoothie maker until recently so I never tried making a smoothie before. A small glass of freshly squeezed orange juice first thing in morning is just good enough to me and I have never particularly wanted having a smoothie before. However, since I started my blog I have been reading posts about a smoothie on fellow bloggers. I was convinced that a Kale Smoothie is easy to make, good for health and also delicious! When the juice maker came to my house I thought ‘Hmmm, I’ve got some organic Purple Kale in my fridge and also some fruit. 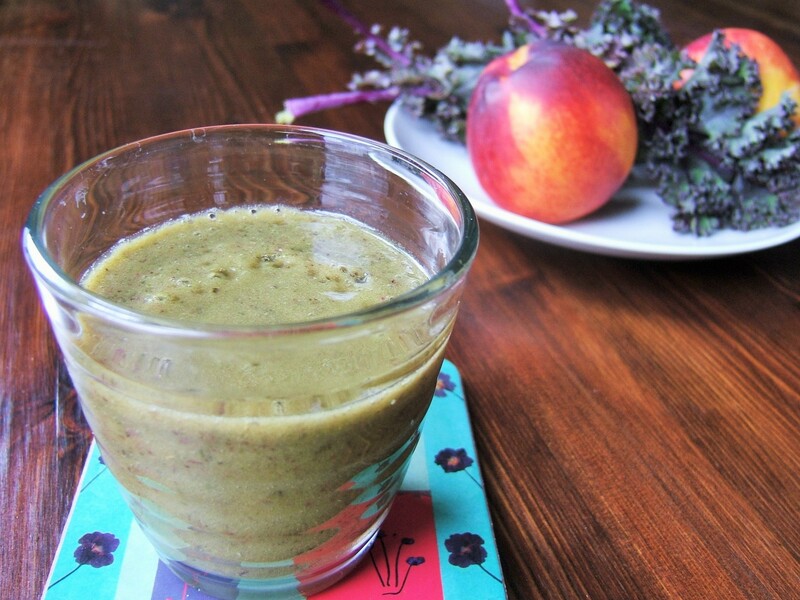 I have a blender now … Why not try making a some smoothie with Purple KALE?’. I mentioned about Japanese Summer tradition in food – ‘Chilled Ramen’ before. There is another Must-Have in Summertime in Japan. That is ‘Kakigori‘ – the Shaved Ice! It is the same as the Chilled Ramen, ‘Kakigori’ also has a traditional Flag to decorate at the entrance of restaurants letting people know that the shop serves it. Apparently the design of this flag has been more or less the same for more than 100 years. 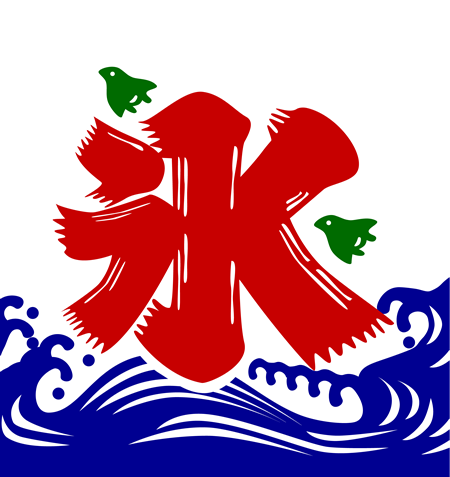 The red part in this flag is a Japanese Kanji character ‘氷- Kori‘ which means Ice. The blue part is obviously the sea that is the symbol for Summer and also there for making you feel Cool I believe. And the green part is two birds called ‘Chidori (Plovers)’. Whenever you see this sign you feel the summer is there and you want to have some shaved ice. I like fruits. I love Mango. I normally eat it fresh with some yogurt or ice cream. But I wanted to make something a little bit more dessert-ish. So I combined everything Mango, Yogurt and Ice Cream. I don’t have an Ice-cream machine and I don’t like any complicated process. I like simple food and this is very quick and easy recipe to have something very pleasant.